If you work in the hospitality industry, you know how beneficial it can be to hear about other people’s success stories. Each Monday, join Adrian Easdown as he has enlightening chats with successful folks in the hospitality industry around Australia. If you’re involved in anyway way with caravanning, running a restaurant or working with any other sort of hospitality-based business, this podcast is perfect for you. 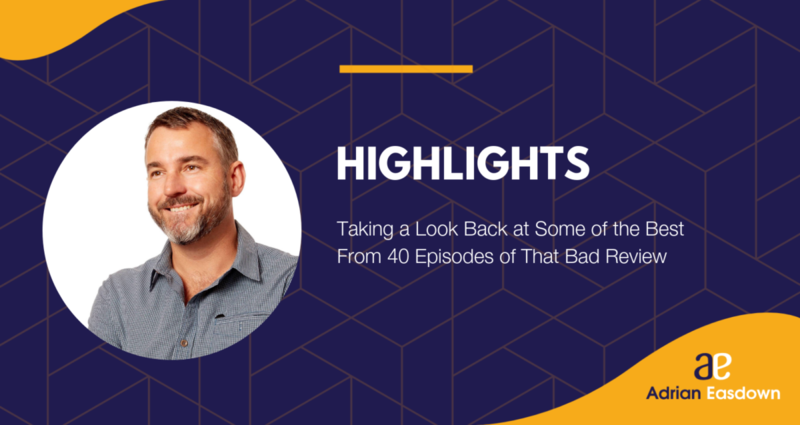 On this episode of That Bad Review we take a look back at the previous 40 episodes and pull out some great insights from our past guests. We head back and revisit episode 1 with guest Belinda Thomas, the award-winning founder and owner of Hire Me Holiday Parks, and park manager extraordinaire who shares with us why you can teach skills to anyone, and finding the right person to fit a specific role, planning recruitment needs – how to avoid the most common mistakes that park managers often make and the importance of walking in your customers’ shoes, and how you can do it. Next we have a chat with Daniel Tilton, in our wide-ranging conversation we spoke about Daniel’s experience in (and out) of the accommodation industry, his thoughts on different marketing approaches, seasonal challenges and of course that one bad review. I wanted to head back in and revisit my chat with Michelle Weston in episode 14, Michelle shares with us her experiences and the lessons learned from years at the forefront of the industry. Michelle provides her insights on where the industry is headed and the impacts that the industry faces. It’s an episode that is packed with great advice, whether you’re in the caravanning industry or not. It would not be a highlights episode without including Stuart Lamont – we chat about how the caravan industry is booming in Australia and how anybody, no matter what age or background, could benefit from a trip through the outback. Stuart is also an incredibly wise business owner, and we talk about how positivity and understanding in customer relations goes a long way. Lastly we revisit episode 26 with Amanda Hinton, our talk covered everything from how Amanda earned respect from her older colleagues as a 21-year-old manager to her tips for marketing in the digital age and how she keeps her guests at Capricorn Caves having a good time. She’s something of a prodigy in her business and has a lot of great advice to give. Grab a cuppa and enjoy the highlights of That Bad Review.